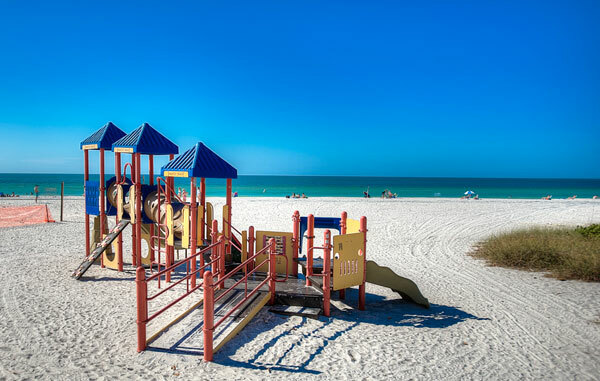 Anna Maria Island, just a little bit of paradise…. 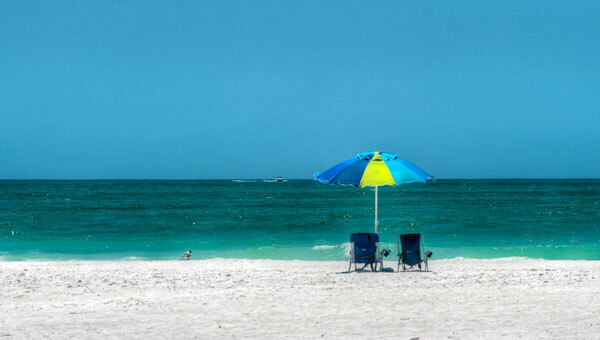 Whether you are an island resident, a traveling guest, or a seasonal renter, one thing is for sure on Anna Maria Island – there is always something to do. If one is bored, then one must truly be boring. There are clubs for every interest on the island: sewing, reading, theater, poetry, art – the Island Library would be a place to start looking for what interests you. If you prefer to spend quiet time alone all you need is a beach chair and a good book (along with some sun tan lotion). Some folks just enjoy a long walk along the aqua waters of the Gulf of Mexico. Aside from the grocery and hardware stores, Anna Maria offers a mecca of boutiques, antique shops, galleries, clothing stores, gift shops and the weekend yard sales and flea markets…or one might venture down to St. Armand’s Circle. Each city offers their own unique version of the ‘city mall’: Bay View Plaza in Anna Maria, two shopping centers in Holmes Beach and the unique shops of Historic Bridge Street in Bradenton Beach. Sprinkled in between are the many shops for essentials or for those that offer the perfect island t-shirt. You might stop by Ginny and Jane E’s in Anna Maria City to browse through the nostalgic antique displays or just enjoy an iced tea at one of the tables. Ginnie’s also has a flower shop and a small internet cafe. There is an amazing variety of restaurants on the island representing every type of food. The restaurants on the right have menus posted on the web that you can preview. For more information on restaurants check out the island newpapers, or just ask a local. If you like moderate priced seafood and want to sit on the beach at sunset, then the Sandbar or the Beach House are recommended. The Sun House Restaurant & Bar is just across the street from the Gulf and features “Floribbean Cuisine” which is the fusion of American cooking traditions with Caribbean and Latin American ingredients. If you want to sit on the bay front, the Waterfront Restaurant at the Bay View Plaza is for you. For wonderful funky fun, take a chance and go to Mr. Bone’s in Holmes Beach where you choose your beer from a coffin in the reception area. If it’s just a sandwich you crave, then Rudy’s in Anna Maria might be perfect (better yet, take it ‘to go’ and have a picnic on the beach just 1 block away)…and after it all, take a trip down to Bradenton Beach for ice cream at Joe’s Eats and Sweets. Anna Maria has it all, from the famous Duffy’s burgers to the ultra elegant meals served at the award winning Beach Bistro…or maybe Rotten Ralph’s would be the place, where you can pull up to the dock in your boat and place your order. For more restaurant information go to AnnaMaria.net. There are 7 miles of Gulf of Mexico Beaches on the island and many smaller beaches on the Tampa Bay and intracoastal waterways. Parking on the island is always a problem. If you live or rent in Anna Maria City, you can walk to the beach – otherwise, be mindful of the areas where parking is not allowed. Also, the Anna Maria City beaches have no lifeguards or restrooms and swimming is at your own risk, but you’ll find the most beautiful beaches in the world. Holmes Beach has the Manatee County Beach has a lot of available parking along with shaded areas with picnic tables, restrooms and the Cafe on the Beach. There are other beach areas in Holmes Beach, but again, parking may be a problem on the residential streets. Coquina Beach in Bradenton Beach has plenty of parking (some parking in shaded areas), plus lifeguards at the main beach. Make sure to take along the sun screen – skin burns quickly in the sub-tropics. Just about every weekend one of the cities will have something going on – either an art festival, flea market, or the Privateers will be smoking mullet in a parking lot. It’s best to consult the island newpapers to see what is going on. The Island Community Center has different events throughout the year, along with many of the clubs and organizations that sponsor various fund raisers. Also the art galleries on the island have monthly art walks and openings. Many of the area restaurants and bars offer evening entertainment, Rotten Ralph’s, DeCoy Ducks, reggae on the beach patio of the Sandbar, or Dr. Dave at one of waterfront restaurants – you’ll surely find some toe-tapping music. If opera or concerts are more to your liking, check the schedules for the Sarasota Opera, the Aslo Theater, the Van Wezel in Sarasota, and the Manatee Players at the Riverfront Theater in Bradenton. The Island Players schedule is posted at the theater on Gulf Drive in Anna Maria. Mote Marine is just a short drive away on Longboat Key or if your want to see a Manatee up close, the Florida Museum is certainly worth the 15 min. drive. The museum includes the Bishop Planetarium and Parker Manatee Aquarium where our beloved Snooty has resided all these years. Selby Botanical Gardens – home of world class orchids – is a wonderful way to spend a day, but some folks just like to kick back and watch the birds or the dolphins at play in the gulf… Anna Maria Island offers lots of choices. 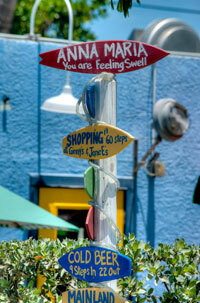 Anna Maria Island is within driving distance of many of the major Florida attractions: Disney World, Sea World (2 ½ hrs. drive), Universal Studios, Orlando’s Church Street Station, Busch Gardens in Tampa, Cypress Gardens and the Kennedy Space Center on the east coast. Locally you might want to visit the Ringling Museum, Selby Gardens and Mote Marine. Why not explore the island by bike or kayak from Beach Bums rentals? With a large, meticulously maintained, rental fleet of bikes, kayaks, surreys, sunfish sailboats, golf carts, baby equipment and beach supplies, they even have a marine biologist on staff to conduct kayak eco-tours. Visit www.beachbumsami.com for more information. For more island fun, check out the boating and water sportactivities and the art scene for the schedule of gallery events. As you can see, there is no excuse for boredom on Anna Maria Island. From the relaxing walk on the beach at sunset, to the day trip to Disney, the choices are varied and up to you to investigate. Considered one of the finest golf courses on the west coast of Florida, University Park has won numerous awards including a 4-Star rating from Golf Digest’s “Places to Play”. The 27 hole course designed by Ron Garl offers golf instruction by PGA Professionals, a stocked pro shop and practice facilities. 7am-6pm daily.